Using multiple pieces of equipment, especially high powered grow light systems, is guaranteed to generate heat. In a grow room, this heat can have a negative impact on plants. Excess heat may even be intense enough to kill them completely. A reliable, correctly sized A/C for the grow space can be the saving grace for plants that would have otherwise wilted in the heat. These air conditioners are compact and incredibly convenient. Portable A/C units can be easily wheeled into whatever space they need to cool. They are an excellent choice for grow tents, as they do not require any intense installation. 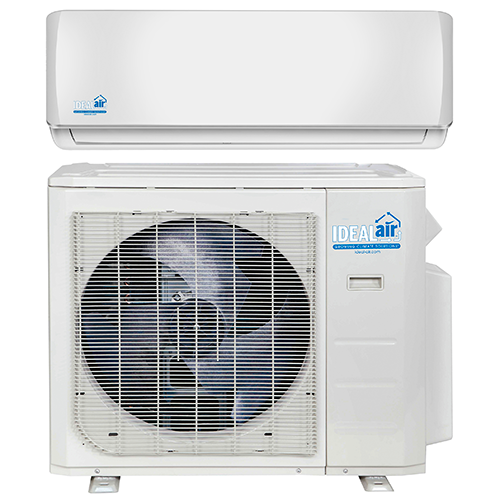 This particular type of A/C is also great for those who do not have experience with setting up air conditioners, as they really only require the user to be able to plug in the unit for it to be able to function. 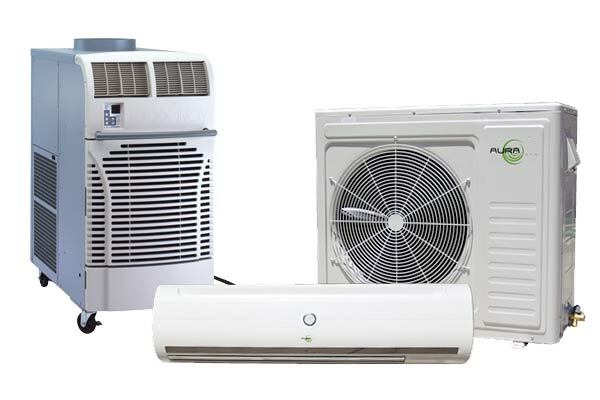 Portable air conditioners work by pulling in the heated air for the cooling process, distributing the cooled air back into the room, and exhausting the heated air through ventilation tubing that can be pointed out of a window or directed into a separate room. While these units are great for smaller spaces and grow tents, they are typically not intended for use in large grow rooms. These lack the necessary power to control the temperature in large spaces or commercial gardens. You can find all of our portable A/Cs here. 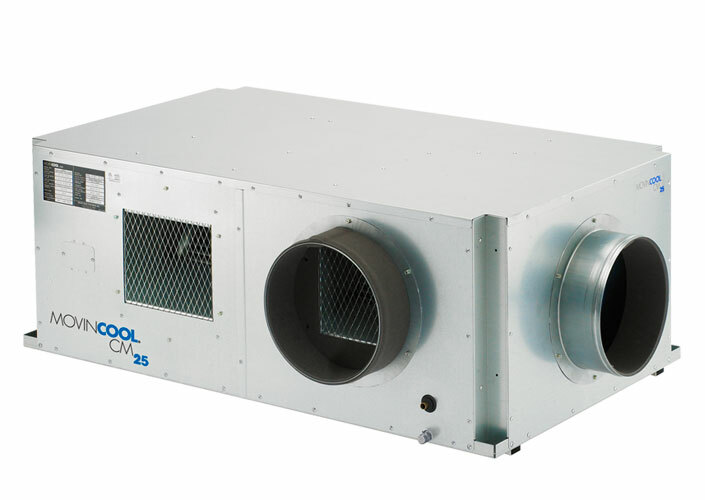 These units require slightly more effort for installation, however, offer much more power for cooling larger or hotter areas. 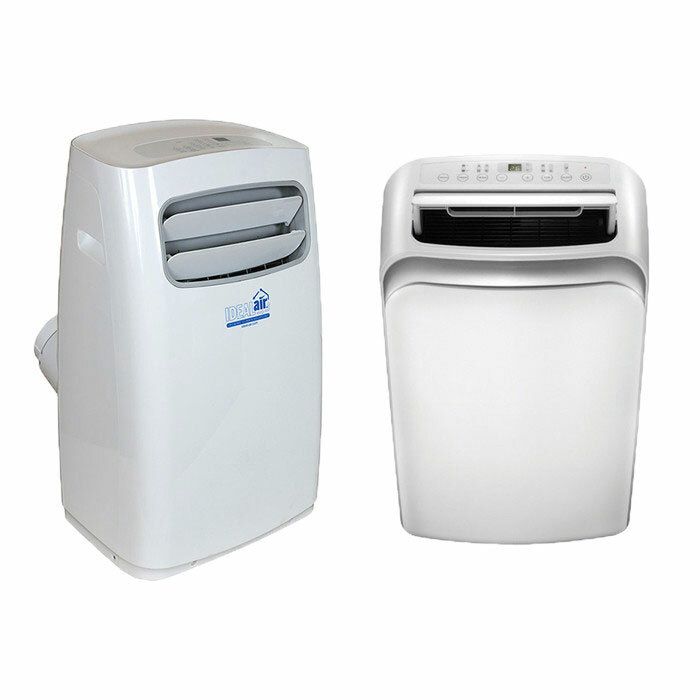 Rather than being an all-in-one unit like portable air conditioners, mini-splits come with two main components. One part is the indoor unit referred to as an air-handler that gets mounted to a wall. This component is needed for distributing the cool air. The other part is a condenser that expels the heated air and moisture created from the cooling process. This piece of equipment is typically installed outside the growing space. 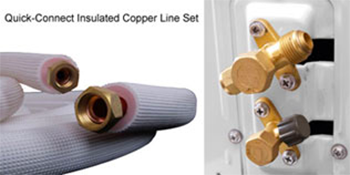 These two separate parts are connected via a line-set consisting of conductor wire, and refrigerant line. 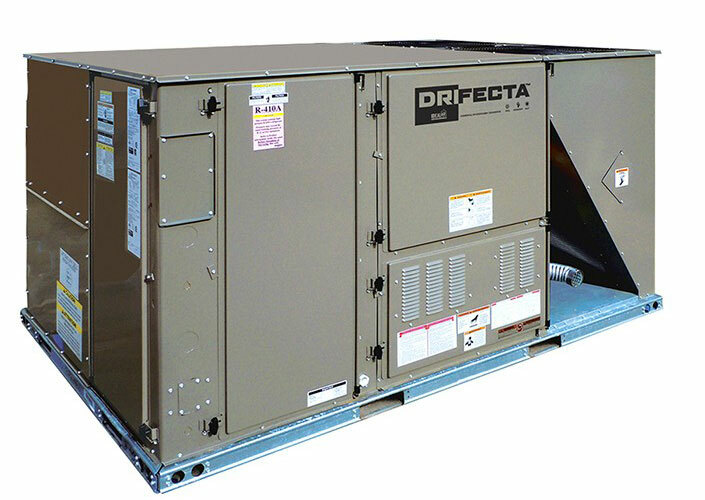 These types of air conditioners require more installation, due to the indoor air-handling unit needing to be mounted to a sturdy wall, so they are not ideal for grow tents. Mini-splits are also not as simple as portable air conditioners. You may need to seek the advice or assistance of a professional. They are however well-suited for larger grow rooms, as they are more powerful than portable units, and more capable of cooling larger and hotter spaces. All of our mini-split a/c units can be found here. Similar to mini-split units, the installation of these requires mounting a component to the ceiling of the space that needs to be cooled. This is an excellent option for growers who need to cool their grow room but can’t afford to sacrifice any floor space. In many gardens, space on the floor is a valuable commodity. Also similar to mini-split units, the installation of these air conditioners may require you to seek the help of a professional. You can find all of the ceiling mount a/c units we carry here. These are the most powerful, largest air conditioners available. Commercial units are used in large scale commercial gardens that have major air conditioning needs. Other units are unable to expel heat generated by all of the equipment used in these operations. These large grow spaces can have dozens of intense light systems, carbon dioxide generators, dehumidifiers, and more running for 12+ hours daily. This can generate a tremendous amount of heat that a smaller A/C would have no hope of cooling. These units are typically mounted on the roof of the building that they are cooling. One unit is usually powerful enough to regulate the entire building’s temperature rather than just a single room like most other a/c systems. The installation of this particular type of air conditioner should only be handled by a professional. 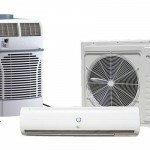 All of the commercial a/c units we carry can be found here. 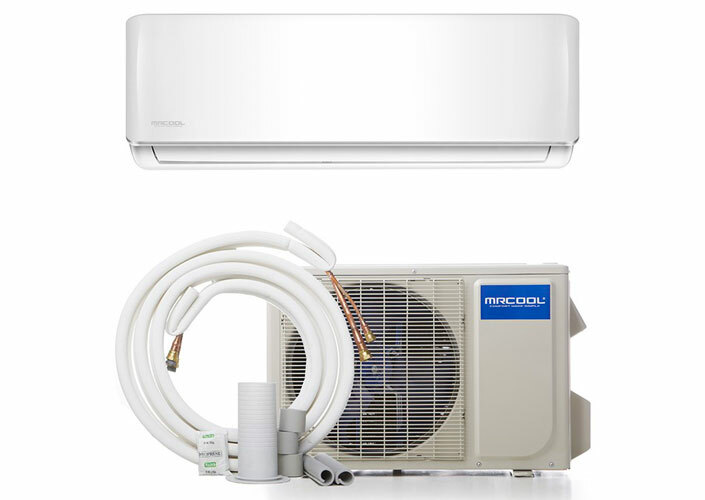 When trying to narrow your search for an air conditioner, you can do so by the type of installation that the device requires. Quick Connect or DIY- These are air conditioners that are easy to setup and use for someone that has no previous experience. Portable air conditioners fall within this category. HVAC Professional - These are air conditioners that require the expertise of a professional with HVAC (heating, ventilation, & air conditioning) experience. These are units such as ceiling mount, and commercial grade air conditioners that would be unwise or dangerous to install on your own. Air conditioners are rated by how many BTUs they are capable of removing from the air, per hour. BTUs, or British Thermal Units, are used to measure thermal (or heat) energy. Sizing an air conditioner correctly is extremely important. Choosing a unit that is not powerful enough to cool the grow space will cause the air conditioner to run constantly. This will be a waste of electricity, and shorten the overall lifespan of your a/c. Alternatively, if the air conditioner is too powerful, it may cause the unit to short cycle. This means that the air conditioner would cool the room to the desired temperature, and then shut off. It would then have to cycle back on soon after to maintain the ideal temperature. This constant power cycling is not only a waste of electricity, but also can be detrimental to the components that the unit is composed of and it could also shorten the lifespan of the air conditioner. Correctly sizing an air conditioner for use within your garden doesn't need to be difficult. Sizing depends entirely upon the size of the grow area, and the equipment being used within the grow area. As an example, let’s say you are growing in a 10x10 grow room, with four Delux 1,000 watt HPS lights, each of these powered by a Delux 1,000 watt ballast, and a Titan Ares 2, which is a CO2 burner used for supplementing extra CO2 to a garden. To determine what size A/C you need, first calculate a rough estimate of the BTU/hr being produced by the equipment in the grow room. We know that one 1000W HPS lights would produce 3,412 BTU/hr. 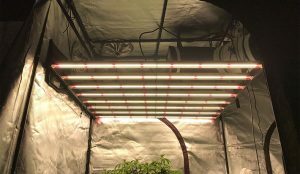 This would need to be multiplied by four, as there are four lights being used in the grow space. This brings us to 13,648 BTU/hr being produced. We would then refer to the specs for the Ares 2 to find that it produces 4,526 BTU/hr. This piece of equipment produces more heat than most, as it utilizes combustion to produce CO2 for the garden. This combustion leads to a hotter grow room. The BTU/hr from the lights would then be combined with those being produced by the CO2 burner. This would bring us to a grand total of 18,174 BTU/hr being produced by the hottest pieces of equipment being ran most often in the garden. So, to regulate this heat, you would want an air conditioner that is rated at at least 18,174 BTU. You would be hard pressed to find an a/c that perfectly matches that figure, so round up to be safe. For the example we laid out a mini-split a/c rated at 24,000 BTU such as the DIY Ductless 24000 BTU Air Conditioner and Heat Pump with Quick Connect unit made by MRCOOL, would be able to handle the room on a standard day, as well as being able to still manage to keep the temperature controlled if there were a heat wave in your area, and still not too over-powered to the point of causing short cycling. When recreating mother nature within a confined space, it is inevitable you will battle temperature. Having a reliable and correctly sized air conditioner can be the difference between a happy harvest, or a bunch of crispy, dead and wilted plants. Don’t make the mistake of waiting until temperatures in your tent are hitting the triple digits. Order an a/c now and be ready for whatever heat may come your way. View our full A/C conditioner category here. If after reading this you still find yourself unsure of which air conditioner is best for your setup, don’t fear! Our experienced professionals are always happy to help resolve any issues you may be facing in the garden. We can be reached Monday - Friday at 888-815-9763. Want to learn more about optimizing your environment? Check out our full blog category on grow room and garden environment, including or full guide to grow room atmosphere!